An appeal for nostalgia ahead of this year’s landmark 200th Otley Show has produced a flood of information and pictures that will help organisers chronicle the long and proud history of the event. at the 1957 Otley Show. 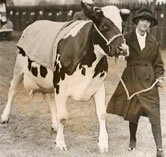 Janet Raw, secretary of Wharfedale Agricultural Society, reports that among the many submissions received was a photograph taken at the 1957 show of the then Princess Royal with Pat Lofthouse, chairman of the produce section. The Royal guest of honour was King George V1’s sister Princess Mary, Countess of Harewood, and Mrs Lofthouse, now 83 and living in Forest Gate, Otley, well remembers the occasion – one of countless highlights over her many years of service to the show. In fact, Mrs Lofthouse was probably the first-ever lady to serve as a show committee member when she accepted an invitation to join the produce section soon after the Second World War. She was soon made vice-chairman and later produce chairman, a position she held for 20 years. Mrs Lofthouse’s late husband Frank was Otley Show’s honorary veterinary surgeon for many, many years, and the family connection with the event continues, as her son Mark is the long-serving ground chairman. Mrs Lofthouse remains a vice-president and regular attendee at the show and says she is looking forward to the milestone bicentenary of Britain’s oldest annual one-day agricultural show, to be staged on Saturday, May 16, at the Bridge End showground. Other nostalgia submissions include a second picture of the Princess Royal presenting a trophy to Miss Foster, of Menston, in 1957, a photograph of past chairman and exhibitor Jack Nelson in the pigeon section, along with other old pictures of the showground, exhibitors and animals. All will form part of a special display chronicling the 200-year history of the show, which is being put together by president Mervyn Lister for display in a marquee sited alongside the main arena. It will be set out in four sections, each covering a 50-year period during the lifetime of Wharfedale Agricultural Society. Attendants will be dressed in the style of a particular period, with children also involved in the initiative. A Jubilee Parade is also being planned to take place in the main ring with a commentary about farming and the show’s history over two centuries. Organisers report that arrangements for what is set to be one of the biggest and best days in the show’s history are proceeding on schedule. As usual, Otley will be the first big agricultural show of 2009, featuring traditional livestock, equine and animal classes, supported by classes for local produce, handicrafts, floral art, farriers … and more. Waitrose in Otley has again agreed to be main show sponsor, while, among other sponsors to date, sizeable contributions have been pledged by Otley-based paper stationery products manufacturer and supplier Sinclairs, Stephen H Smith Garden & Leisure, Otley, and B & TS Builders Merchants, of Otley and Ilkley.